Zinus and Casper have set their own benchmark in mattresses segment. But there is a stark contrast between the two. First is the price variation. Casper is a high-end luxury memory foam mattress that costs nearly four times the price of Zinus green tea mattress. And secondly, the comfort, especially the “zoned support”, offered by Casper is exceptional and one of its kind in the industry. Whereas, Zinus is more of an affordable mattress but has several benefits attached to it than being a regular memory foam mattress. For example, the green tea extract and the castor seed oil infused into the mattress help keep the mattress anti-bacterial in nature and odor free. Zinus green tea mattress is the best option in budget mattresses segment while Casper is top choice in luxury premium mattresses segment. Following is a quick comparison between Zinus and Casper mattresses. While Zinus is a 3 layer construction, Casper is made of 4 layers. For Zinus mattresses, all layers are infused with green tea extract. This extract is anti-bacterial in nature and protects the mattress from harmful bacteria arising from sweat and moisture accumulating on the sleeping surface in the long run. The castor seed oil removes unpleasant odors and keeps the sleeping surface fresh. Other regular budget mattresses also cost the same like Zinus, but they are plain memory foam layers without add-ons like green tea extract and castor seed oil. Casper with 4 layer construction offers all the luxury of sleeping on a premium memory foam mattress. There are several takeaways from its layer construction. First, the top proprietary layer which is a blend of latex foam but carries the support of a visco-elastic foam. Latex foams are a pleasure to sleep on, owing to the bouncy feel and the plush surface. But the mattress has to support your body weight in first place. And this support is perfectly offered by a visco-elastic foam. Remember, visco foams are supportive but not plush. Perhaps, this is what prompted Casper to blend the two foams and come up with its own proprietary foam that carries all the traits of a latex foam and visco-elastic foam. The third layer in the 4 layer construction is proudly called as “zoned support” layer. The reason being that it offers two different firmness levels. This layer is divided into two sections. While the upper section from head to hips is soft, the lower section, i.e. from hips to legs is relatively firm. The hips and the back are the prime areas that carry maximum weight and tend to exert more pressure on the mattress. And if the layer has same firmness level across the entire surface then the middle section around hips and lower back tends to dip further into the mattress. This gives a feeling as if your back is stuck into the mattress. This is why Casper has thought out of the box and designed a single layer with different firmness levels and termed it as “zoned support”. Both Zinus and Casper offer more or less the same firmness level. Yet, Casper stands at 6.5 while Zinus green tea mattress scores 6 on a scale of 1 to 10. Owing to the 4 layer construction, Casper has to be plush than Zinus which is again a 3 layer construction. But the top proprietary layer in Casper and the third zoned support layer hold body weights perfectly without allowing you to sink deep into the mattress. Hence, the firmness stands at 6.5. Casper is top class and there is no second opinion when it comes to motion isolation. Although, Zinus too outstanding in its genre of budget mattresses, yet the zoned support layer in Casper stands out from the rest. The third zoned support layer provides even sleeping surface, no matter whether you are heavy or lightweight. 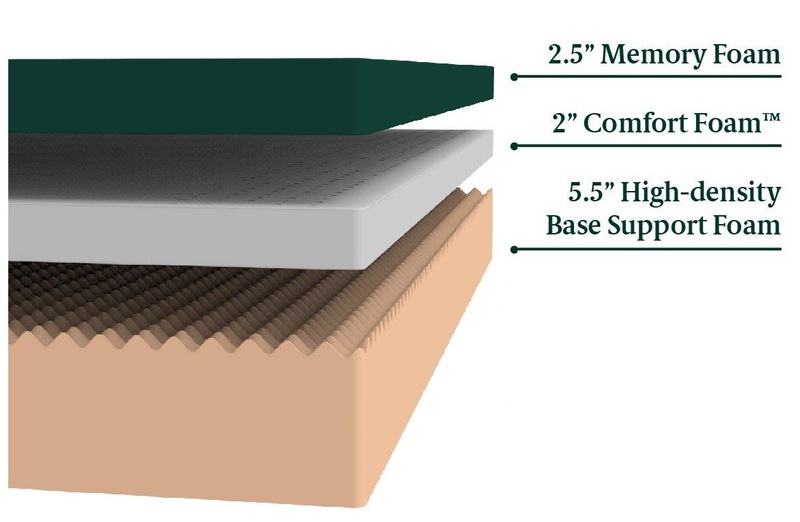 Zinus: The top 2.5 inch memory foam is the only layer that sinks with body weight. Or rather we can call it as the layer that conforms to body curvature. Hence, the sink is limited to 2.5 inches or at the maximum 3 inches. And, the radius of impact shall also be around 3 to 4 inches and does not reach up to your sleeping partner. Casper: In Casper, the top two layers i.e. the 2 inch proprietary foam and 1 inch memory foam are the only layers that sink with body weight. Here too, the sink is limited to 3 inches but it won’t sink further downwards. The reason being, the 3rd zoned support layer offers different firmness levels to top body and lower body. And, the sink even if dips down to this 3rd layer, the sleeping surface will still be even and plain. This ensures that the motion transfer is bare minimal and does not carry to your sleeping partner. The higher the size of base layer, the better shall be the edge support. And both Zinus green tea and Casper mattresses offer more or less the same level of edge support. While Zinus comes with 5.5 inch thick high density base layer, the same is 5 inches thick in Casper mattress. A kind of chemical smell emanates from every brand new memory foam mattress. The reason being that memory foams are fully compressed and rolled before shipping. And when they are opened for the first time, the chemical odor starts spreading quickly. The only way out is to open all the windows and leave the mattress for a good 48 hours to 72 hours. This way the mattress expands to its full size and also the smell too disappears. Both Zinus green tea mattress and Casper mattresses come with 10-Year warranty. But Casper also offers 100-night trial period. As said in the introduction itself, both Zinus green tea mattress and Casper mattress belong to different leagues. Although both fall under memory foam mattresses segment but Zinus is more of a budget mattress whereas Casper is a premium luxury mattress. There is no match to sleeping experience offered by Casper but Zinus too has its own share of greatness and is known as the best affordable mattress that comes infused with green tea extract seed oil.